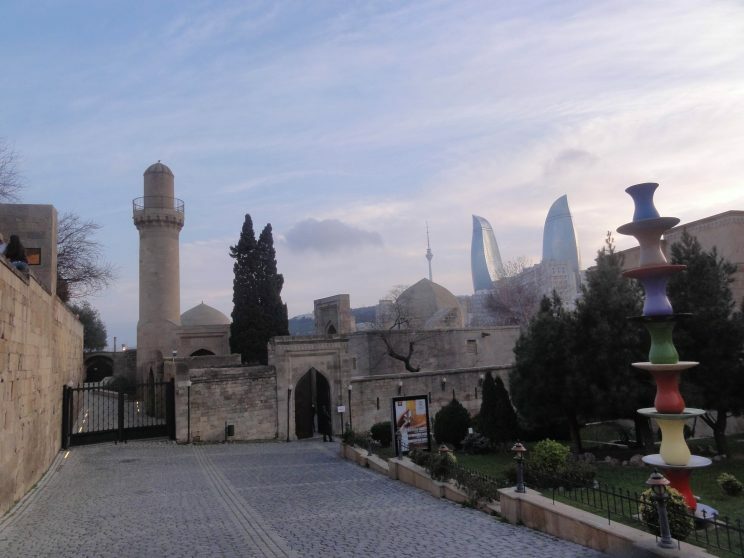 Nizami Ganjavi International Center organized in Baku the VI Global Baku Forum “Bridging Gaps to Create Inclusive Societies” event. It gathered about one hundred former and present Heads of States and ministers from diverse countries. Greetings from the Pope , Presidents of Italy, U.K. and several prime ministers as well as secretary general of the UN were read. Latvian President Vaira Vike Freiberg spoke in the opening ceremony as well as Mrs. Marin a Vardinoyannis, the donor, from Greece. The speeches emphasized the importance of dialogue, openness, democracy, interaction of cultures, equal dignity of all people, risk of intolerance; the event raised the tolerance as the main value to be supported and it celebrated the 100th anniversary of Azerbaidjan nation . Mrs Freiberg underlined just society, decent living, shared and inclusive society, and how only the variability of traits makes a development possible. Differences have to be accepted. This was already the 7th forum in Baku with such encounters among many national leaders. The place was the famous sky scraper ‘flame’ hotel of Fairmont, one of the most picturesque avantgarde buildings of the whole city. As a part of it our colleague professor Rahilya Geybullaeva, the chair of Azerbaijan Comparative Literature Association, arranged a symposium “Nizami’s cultural heritage in the modern period”. Its Scientific Committee consisted of professors from US, U.K, Georgia, India, Brasil, Turkey and Finland – and of course the host country. The themes were centered around the multiculturality and ‘irredentism’ but also postcolonialism, archetypes as recycling cultures, national identity as shared past, medieval symbols and regionalism, and music. The ‘irredentism’ means a situation in which a smaller culture inside a larger and dominant one tries to emancipate and become independent; so something what historically happened in Italy under Risorgimento in the 1860s and, say, in Finland in the turn of century. And it is of course highly actual, thinking only of history of the Azeris themselves, always balancing between Russia and Persia. But who was Nizami? He was a poet, philosopher and scholar who lived in 1141-1209. In the side of Hafiz, the greatest writer in his time. He was able to combine high erudition with great poetic quality. Many of his poems became later better known as operas like his Leyly and Magnun, which another 16th century poet Fizuli arranged into a libretto, and which the national composer of Azerbaidjan Huseyir Hacibeyov (1885-1948) wrote into opera. It is a love story, similar to Romeo and Julia, or Tristan und Isolde, or L’amour de loin by Kaija Saariaho.The same happened with Puccini with his Turandot, originally conceived by Nizami. J.W. v. Goethe discovered Nizami as German and French translations (by Fr. von. Diez and Silvester de Sacy) and wrote after reading: “I cannot separate the Orient and O ccident.” And furthermore: Meine Absicht ist auf heitere Weise West und Ost, Vergangenheit und Gegenwärtige, die Persien und Deutschland zu verknüpfen. (My intention was to combine in a cheerful manner the East and the West, Past and Present, Persia and Germany). Now Nizami has been adopted as the Azeri national treasure since he lived in Ganja which now belongs to Azerbaidjan. 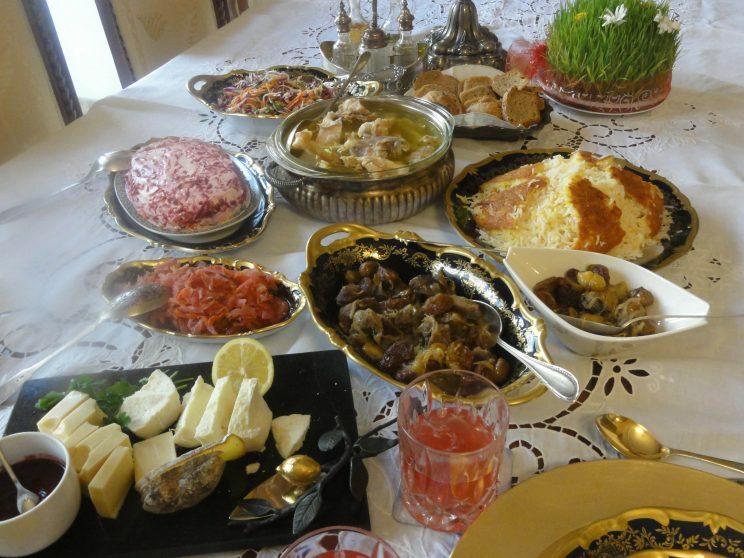 This country would deserve to be better known in the West due to many aspects of its history, not least to the splendor of its capital Baku with highly modern architecture, elegant boulevards and cafeterias like in Paris – but also due to its mountain villages living archaic life; even the names indicate there to a glorious past, mentioned in Gilgamesh. A. o. I was able to visit the town of Tsakatala in the deep Caucasus, close to Georgian and Russian borderline (Dagestan), in the height of 2250 kms from the sea level, region were a minority, the Mountain Jews also live – or share their life between New York and their home country (in New York there are at least three restaurants called “Baku”). 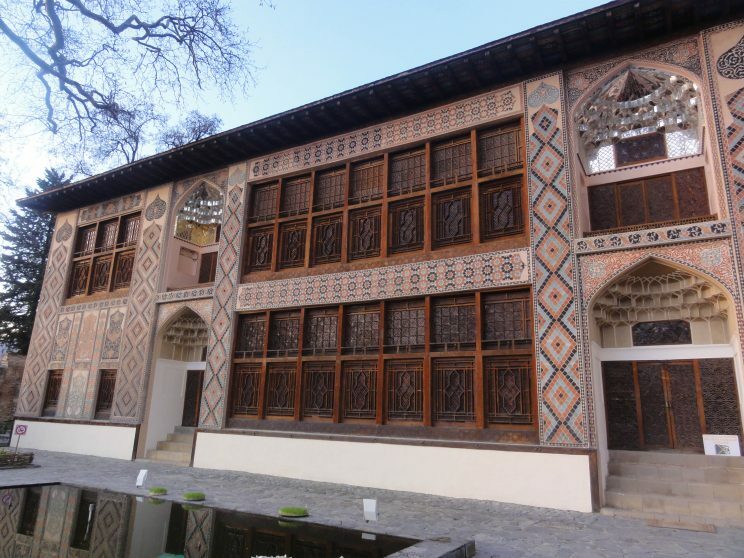 Many places in this area are historic, like the Khan’s palace in Shek, from 1762, carefully renovated as to its precious wooden carvings, the technics preserved by two young brothers. Some monuments stem from the socalled Christian Albanian period, i.e. 4th-7th centuries BC ; once there was on 10th century BC a kingdom of Manna. These states emerged after Alexander the Great and they were powerful societies, at the end linked with Assyria. Yet, the area’s prehistory has some of the world’s oldest state formations from 3000-2000 BC. There are 8,5 million Azeris living now in their country but 30 million in Iran, whose northern part is in fact an Azeri area. Moreover, 3 million Azeris live in Turkey and 3 million in Russia, 1 million in the US, in Afghanistan, Georgia and Germany about half million in each. The Azeri language is spoken by 50 million people. Morphologically, it belongs to the so-called agglutinative languages in which suffix is added to a word’s root to make different grammatical forms. It belongs to Turkic language group, i.e. Uralic Altaic languages like Finnish. That is why it often sounds to the Finnish ears like Hungarian as to its intonation. The unique musical traditional genre is called mugham. The concept can refer to a tonal system but also to a type of melody, with rhythmically free improvisation. It refers to the dastgah mode. Dastgah is a vocal and instrumental composition similar to a suite. Mughams are rhythmically free melodies, alternating with tasnifs and rangs. Dastgahs are usually performed by a small ensemble or trio that consists of a singer (called khananda) and two instrumentalists (sazanda) who play tar and kamancha. The singer accompanies him or herself on the qaval, a percussion similar to the tambourine. The mugham trio has been widespread in Azerbaidjan since the late 19th century. Mugham had a great impact on classical music composers of the country since Hacibeyov. His opera Leyly and Magnun uses authentic mugham singers on stage mixed with Russian epic opera style à la Glinka or Borodin. Even outstanding contemporary composers like Firangiz Alizada, Head of composers’ union says that all her music stems from mugham, see for instance her work Mugam-syaagi , or string quartet and percussion and synthesizer dedicated to Kronos quartet. The most remarkable woman composer Alina Husein-Zade (1916-2005) also used mugham in her romances, cantatas and symphonic pieces as well as chamber music. 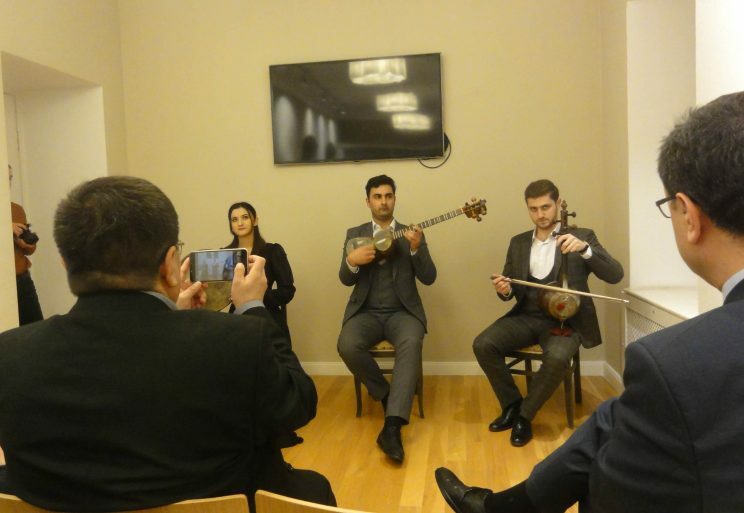 They are extremely professional music, a living part of the Azeri musical heritage.